Sudoku – Pretty puzzling. A free and offline Sudoku app. Presenting you a modern and rethought Sudoku design. By removing excessive details from the screen, we managed to create a fresh and clean look for the puzzle that we all love – at the same time sustaining intuitive gameplay and customization. The user interface is minimal and fast – starting a new Sudoku or continuing right where you left off is just one click away. There are no loading screens. What is more, you do not have to worry about not finishing a Sudoku. If you are in a hurry, just hit back or leave the app in any other way and the app takes care of saving your progress seamlessly. This for all difficulty levels separately. Oh, and hopefully you love gimmicks. 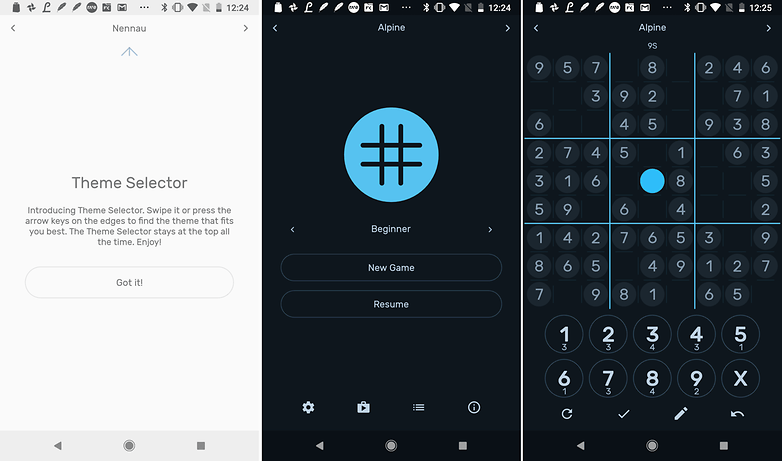 Changing the colors of the UI is not only available during the solving of Sudoku – you can do it literally from anywhere within the app!